I'm sure those words come out of my mouth daily. At least once. I was looking through pictures on my computer and came across some I took a while back and never posted of a Pinterest inspired project. Before continuing, you must agree, cross your heart and pinky swear not to laugh, make fun, of or otherwise judge my fingers, fingernails, or any other part of my very non pampered hands. Agreed? OK, carry on. 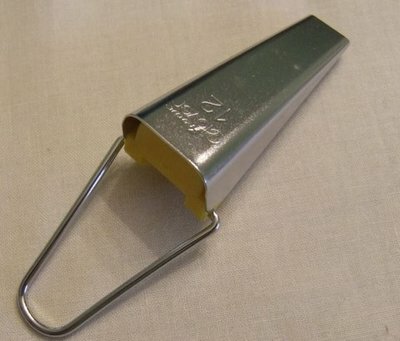 Above is a photo of the Pin (Original Source). And below is my copycat version. They were super easy to make and didn't cost a thing, since I used leftover tissue paper from my sewing room pompoms. To make these you need tissue paper and wire. I used bread ties. Cut circles from stacks of tissue paper. I think my circles were about 3 inches in diameter with 8 layers of paper. Don't worry about perfection. Fold the stack of circles in half, then in half again. Round off the edges so that you have what looks like ice cream on a cone. Stop judging my fingers. You can't get lotion in this part of North Carolina. We're very remote. Yea, that's my story. Unfold and you magically have flower petals. Arrange the layers so that the petals alternate. Remove the plastic coating from one end of a bread tie and stick it through the center of your stack of petals. Make a small loop so that it doesn't slide back through. Starting at the top, separate the layers and begin to pinch them toward the center. Continue pinching and separating until you have what looks like a flower. then twist the plastic end of your bread tie into a... twisted bread tie. It's very technical, pay close attention and be sure you get it right. And when you are finished you can put them in a wooden dough bowl with a candle. Just to prove you can recreate a Pin. That's why I did it. I usually like to share thrifty decorating solutions. a little money and save a lot of time and effort. sold in packs of 6 eight foot long planks. The package says it will cover 14 sq feet. or 88 square feet, so we bought seven packs. a light shade, a dark shade and gray. The light shade was golden oak. Don't buy this unless you're going for the color of mustard. Blech! That other can is one I already had. I usually buy Minwax stain, but I decided to give the Rustoleum a try. I liked it. Especially the gray. then wiped off the excess. and others I stained dark then brushed the gray over. wanted quite a bit of variation in colors. Mitch did the first few rows, before he had to go to work and I finished it up. but these guys are so light, you don't really have to hit a stud. we just knew we wanted it to look random, no pattern. When we got to the outlets, Mitch notched out around them. He used a coping saw, but said a utility knife would probably work. Again, being supervised every step of the way. The boards are tongue and grove so they lock together. That allowed me to be sure I was happy with the layout. that I was able to finish with a full sized board at the ceiling. The only place we had to cut the width of the boards was just above and below the window. Mitch made those cuts and used a box cutter. The back of the planks have channels or grooves you can follow for cutting. is pretty thin and it broke before I got it installed. and patched it with wood putty. with my plan. Shhh, don't tell him I said that. Remember, the room is unfinished. Excuse the unpainted window trim. Don't mind the saw on the floor and the ladder in the corner. Or the bare light bulb hanging from the ceiling. It's a bit of a mess around here. an extra little push to forge ahead. It's nice to see my vision coming to life. I have one of those cool bias tape makers. I'm sure you've seen them and the impressive results they produce. I bet many of you even have experienced such results. Not me. I've been a little embarrassed to say, I couldn't do it. I couldn't get mine to work. Then it happened. The proverbial light bulb went off and it became shamefully obvious why. You see, I have the 1/2 inch bias tape maker. I expected to get bias tape that measured 1/2 inch when finished. Pictured above is actually double fold bias tape. The neat little tool makes single fold tape. Now I knew it wouldn't come out of the tool looking like this. I knew it would be a strip with both sides folded in to the center, my problem was making the distinction between the terminology. It may have been wise to read those directions instead of throwing them away. I had been cutting my strips the width needed for 1/2 inch double fold tape. I know, not very smart. Once I had my moment of enlightenment, I cut a strip around 1 inch wide (maybe slightly less) and whatdayaknow, the tool works beautifully! All that semi-coherent babble isn't intended to be a tutorial, since I'm sure you all understood how to correctly use a bias tape maker, or at the very least would be wise enough to read the directions first. 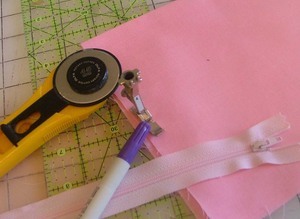 No, the tutorial is for a less fancy, but nearly as effective DIY version of the bias tape maker, and you can easily adjust it to make any size bias tape you like. 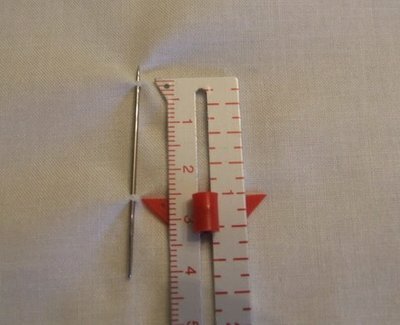 All you need is an ironing board, a hot iron, a measuring tape or ruler, and a long needle. A strip of fabric would be nice too. It doesn't have to be cut on the bias unless you will be going around curves. First determine the width you'd like your bias tape to be (single fold) . 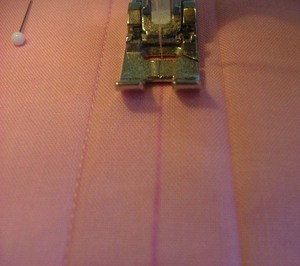 For this demonstration my strips are cut about 1.75" and I want the opening under the pin to be 1". This will give me 1" single fold bias tape or 1/2 inch double fold. 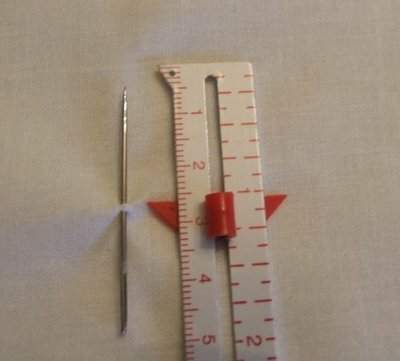 I am using little sewing gauge to determine the placement of my needle. 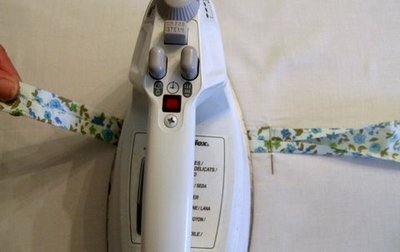 Bring the needle up through the ironing board cover, go over 1" and push it back through the cover. 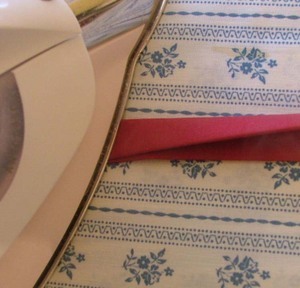 The needle will run perpendicular to the ironing board. 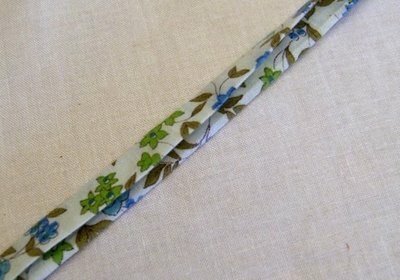 Cut one end of your fabric strip to a point and run it under the needle wrong side up. I am left-handed, so this probably looks very backward to you right-handed folks. Now you know how we lefties feel most of the time. 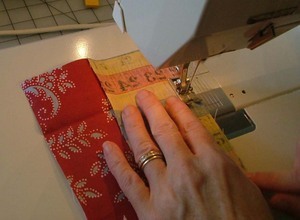 I am pulling the fabric through with my left hand, going right to left. Do whatever feels comfortable to you. When you first start the fabric through, you will probably need to work it a little to be sure it is folding symmetrically. 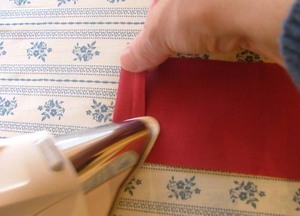 As you pull the fabric through, press the fold in place. Be careful not to burn your little fingers. That's all there is to it. Happy bias tape making, my friends! Since several of you are interested, here is a quick run-down of how cabinets are painted at Casa de Daisy. This is by no means advice from a professional, just what works for me. A foam roller made for painting smooth surfaces. Buy several covers, you'll need a new one for each coat. Paint- look at the can to determine how much you will need. I started with a quart and had to go back several times. If you are doing a small area like a bathroom, a quart should be plenty, for a kitchen, you may want to go ahead and get a gallon. I used semi-gloss oil based paint because I like the finish it gives. It is a big pain to work with. It takes forever to dry and is a mess to clean up, but it dries to a very hard durable finish and shows less brush strokes than latex. I think it's well worth the extra work involved. It's stinky though, so be sure your area is well ventilated. Oil based paint doesn't clean up with soap and water. You'll need something like mineral spirits or acetone to clean your brushes. To clean the paint off your hands, pour a little cooking oil in your palm and rub hands together like you're washing them. Once the paint is loosened up, you can wash with soap and water. If you use oil based paint allow at least three or four days for this project. You have to let the paint dry 24 hours between coats and it will take more than one coat. Remove doors and drawers and the hardware. Depending on the type of hinges you have, you may want to remove those too. My hinges don't show, so I left them on the doors. Clean, clean, then clean some more. Especially important in a kitchen. I used TSP. It's available at Lowes and WalMart. Just mix it in some water, put on some rubber gloves and wipe everything down. After cleaning with the TSP you will need to go back with a clean sponge to remove any residue. If your cabinets have a heavy coat of varnish you may want to sand with a fine grit sandpaper to remove the shine and make a rougher surface for the paint to stick to. I didn't have much shine to worry about so I just scuffed everything up with a scotch brite pad. Wipe everything off again to remove any dust. 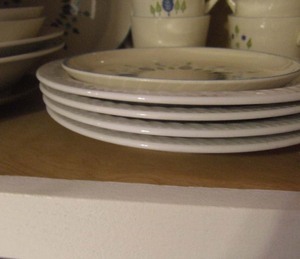 If you have a very steady hand and can paint the cabinets without getting paint on the walls and counter tops you can skip taping. 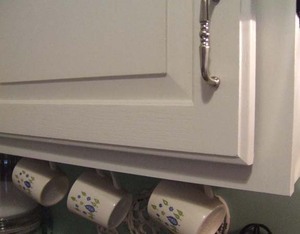 If you're like me, get out the painters tape and carefully tape the areas around the cabinets you would like to protect from paint. Extra time spent taping will be well worth it in the end. Once everything is taped you can start priming. I use Kilz. It comes in a low odor formula, but somehow I ended up with the stinky stuff. It is really strong, so open some windows and turn on a fan. Primer dries pretty fast so by the time you are finished with the last cabinet, the first one will likely be dry and ready for the first coat of paint. If you've never painted with oil paint, be warned that even though it dries slowly, it gets tacky fast. You don't want to go back over it with your brush or roller more than necessary. Try to get a nice smooth coat on and keep moving. My cabinets needed one coat of primer and two coats of paint. Don't be tempted to lay on a super heavy coat to save time, it will never dry. For the doors and drawers, I was fortunate enough to have access to a paint gun- (the kind cars are painted with) and a paint gun operator (Mitch). He sprayed the doors and drawer fronts for me. It still took two coats of paint and had to dry 24 hours between coats and in the end, the cabinets painted with a roller looked as smooth as the sprayed doors. I don't think it saved that much time in the long run, so don't feel like you can't get the same results because you don't have access to a paint sprayer. I removed my tape between paint coats, just out of fear I would pull paint off with the tape if I waited too long. Once you are satisfied with the coverage, you'll want to let it dry at least 24 hours before replacing the doors and drawers so you don't mess up all your hard work. Also in the first week or so after painting try to be very careful, the paint will be soft to begin with, but trust me, once it has time to fully cure, the finish will be quite durable. 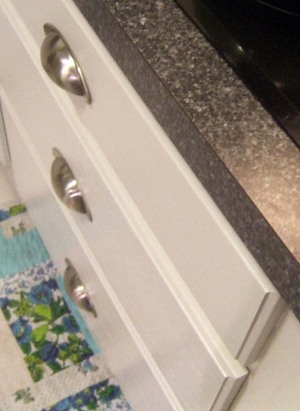 Here are some more cabinet painting tips I found online. Zippers seem to be the boogyman of sewing. The monster under the bed that puts fear in the hearts of sew-ers. And like the boogyman zippers need not scare you, the fear is only imagined. For a long time I avoided anything that required putting a zipper in. 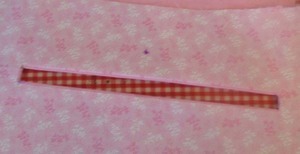 I'd check the back of the pattern to see if a zipper was required, if so, that pattern went back in the drawer. One day I decided to give it a try, just to see if it was as bad as I had been led to believe. It wasn't. Oh, I'm sure it wouldn't have won any awards but attempting that first one proved that I could do it. Putting a zippered pocket into a purse is a good way to wet your feet, so to speak where zippers are concerned. Zippered pouches is another. 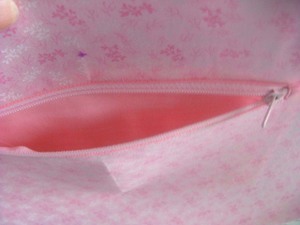 This is the method I use for putting a zippered pocket in a purse. 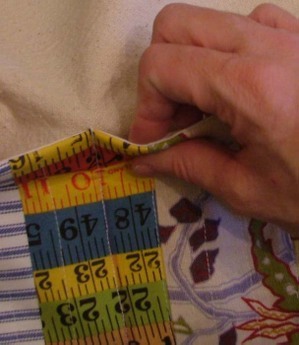 The pocket is put in one side of your purse lining before assembling it. 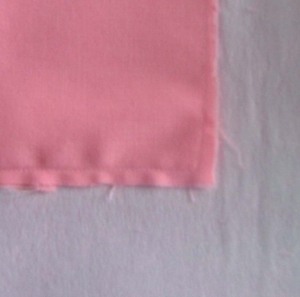 Fabric for pocket: A rectangle that is about 9" wide. The length is determined by how deep you want your pocket. This one is about 12" long and my finished pocket will be about 5 1/2" deep. 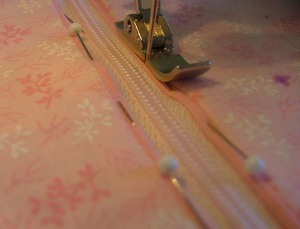 Zipper foot: I think this is key to putting zippers in. If you don't have one, I recommend getting one. 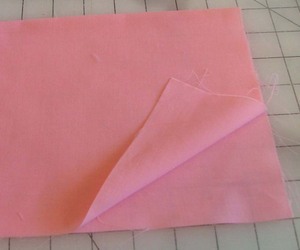 Fold the rectangle in half the long way to determine the center line. 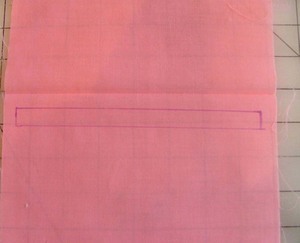 About 1/2" below the center line draw a rectangular box that is 1/2" x 7 1/2"
Pin the pocket onto your purse lining piece. Position it so that the rectangle is where you want the pocket to be. 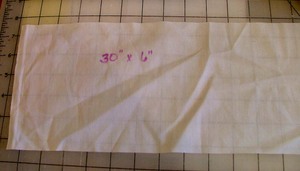 Mine is about 2 1/2" from the top edge and centered on the lining piece. 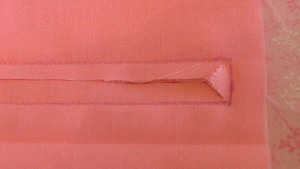 Cut a slit in the center of the rectangle through the pocket and the lining stopping about 1/4" from the ends and cut at an angle to the corners. Center the zipper right side up in the opening and pin securely in place. 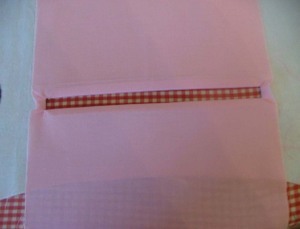 (you could also use fusible tape to secure the zipper before stitching) Be sure the pocket fabric remains open flat and away from the opening. Stitch along the edge of fabric, close to the zipper tape all the way around the zipper. 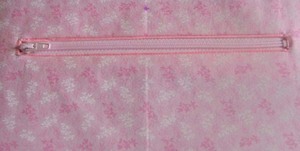 There you have it, a zippered pocket in your lining. This tutorial is based on my interpretation of the pattern found in Machine Made Patchworks. I highly recommend the book, it is full of great projects. I did not follow the pattern exactly and have no idea what the instructions say, as they are written in Japanese. 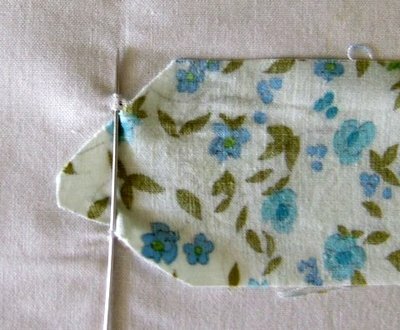 The apron featured in the book has the patchwork sewn onto a base with the edges left raw, not sewn in strips. 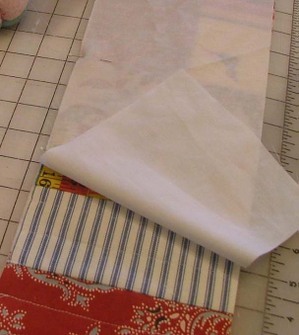 Decide how you want your patchwork pocket to look and cut strips of several different prints in various sizes. This will make the pocket. For the design above I cut 7 strips 6 inches by 3 inches (see either end in picture of finished apron above), four strips four inches wide by three inches tall ( bottom center), one strip approximately 12.5 inches long (red piece top center). Step One Lay out your patchwork, overlapping the pieces by 1/4 " until you have it approx 30" x 6"
Once you are happy with the layout sew your strips together. 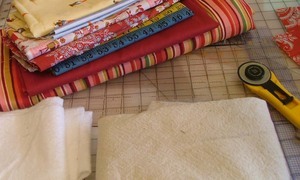 If you want to use the layout I've used, start by sewing the 3" x 6" strips together. 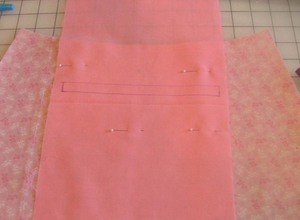 (sections 1 & 2) Next sew the 4" x 3" pieces together (section 3). Once each section is sewn together press your seams. Sew sections 3 & 4 together, trim as needed for sizing, press. This will be the center section, sew sections 1 & 2 to either end. Phew... do I have you completely confused? I think I am. Once you have that all pieced together cut your cotton batting slightly larger than the patchwork and place the patchwork on top of the batting. 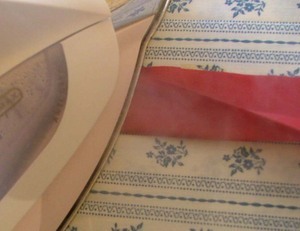 I use a temporary basting spray to hold it securely for quilting and I also pin it in several places. Machine quilt straight lines approx 1" apart across the patchwork. 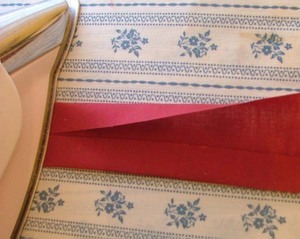 I use a quilting guide on my walking foot, but you can mark the lines with a water soluble pen. 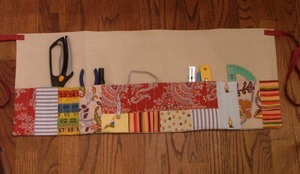 Trim the excess batting and patchwork to fit your lining piece 6" x 30"
Place lining on top of patchwork right sides together and sew across top only. Turn to right side and press. 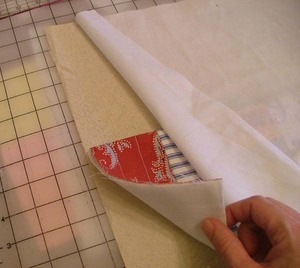 Place the apron piece (canvas) right side up on your work surface, place the pocket right side up lining it up with the apron bottom, on top of that place the apron lining. 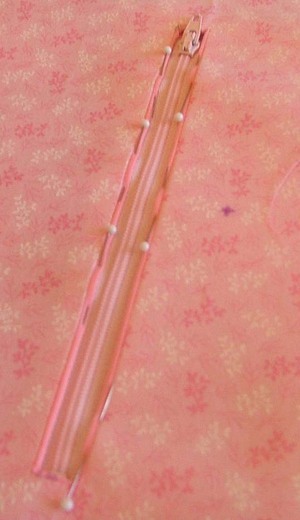 Secure with pins and sew around all four sides, leaving a small (approx 4" section at top for turning right side out). Trim seam allowances turn and press. Mark the divisions for your pockets. There will be five pockets. The finished width of the apron is about 29 inches making the pockets approx 5 3/4". I say approx because I stitch the pocket section over one of the existing quilting lines, so they will likely not all be the exact same size. 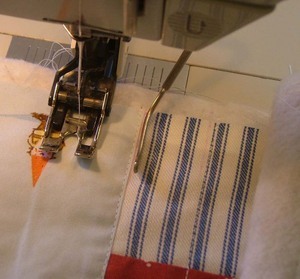 Sew down the division lines, making sure to secure the top of the pocket by backstitching several times. Now all you have to do is make and attach the straps and you're finished. 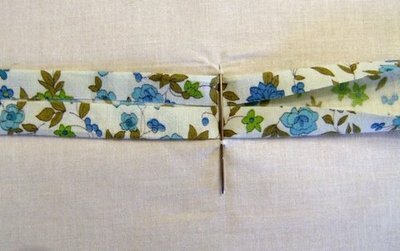 Fold the short ends of the straps in approx. 1/2" and press. Fold again to hide raw edges, press... yes there's lots of pressing. Like my pink iron, by the way? Repeat with other strap. 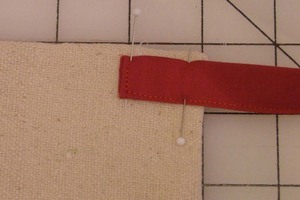 Sew down the open side and you're onto the final step. Pin in place about 1" in from the end and 1/4" down from the top of the apron. Repeat with other strap. Sew straps in place and sew across top of apron to secure opening that was left for turning. 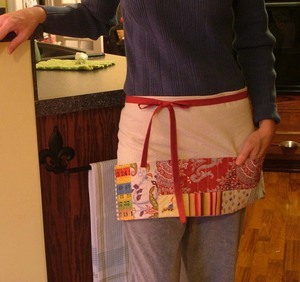 If you would like to make an apron brilliantly designed especially for a seamstress by a seamstress, check this one out.